LEIPZIG, Germany, February 27, 2015 (ENS) – The application of insecticides poisons streams in roughly 40 percent of the global land surface, new research reveals. Streams in the United States, the Mediterranean, Central America and Southeast Asia are most at risk. These findings are drawn from the first global map to be modeled on insecticide runoff to surface waters, which has just been published in the journal “Environmental Pollution” by an international team of scientists. Until now the global extent of the potential water pollution from the application of insecticides has remained largely unknown, according to the authors, who are researchers from the Helmholtz Center for Environmental Research and the University of Koblenz-Landau together with scientists from the University of Milan, Aarhus University and Aachen University. “Our analysis provides a global map of hotspots for insecticide contamination that are a major risk for biodiversity in water bodies. To our knowledge this is the first study that assesses insecticide contamination of water bodies on a global scale,” says Professor Dr. Matthias Liess from the Helmholtz Center, who serves on the scientific advisory board for Germany’s National Action Plan on Sustainable Use of Plant Protection Products. 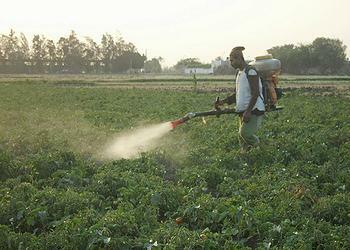 The authors estimate that about four million tons of agricultural pesticides are applied annually around the world, equating to an average of 0.27 kilograms per hectare of the global land surface. Pesticide contamination of streams kills their invertebrate inhabitants such as insects, crustaceans, snails and worms. These small creatures are often used as indicators of the health of streams. “We know from earlier investigations that pesticides can reduce the biodiversity of invertebrates in freshwater ecosystems by up to 42 percent and that we can expect an increased application of pesticides as a result of climate change,” explains Dr. Liess. He warns also of an increase in the application of pesticides in many developing countries as farmers switch from traditional agricultural practices to more intensive ones. The researchers produced several world maps. The vulnerability map only takes into account the geographic and climatic background. The risk map shows the risks from this natural vulnerability through human land use. “The risks of insecticide exposure to water bodies increased significantly the further South one travelled on a North-South gradient in Europe, North America and Asia, mainly driven by a higher insecticide application rate as a result of higher average temperatures,” said Dr. Mira Kattwinkel, a researcher at the Swiss Federal Institute of Aquatic Science and Technology. Because the economy and the population are growing rapidly in many countries of the southern hemisphere, scientists expect a higher insecticide application rate in those countries in the future to cover an increase in agricultural production. “Daily rainfall intensity, terrain slope, and insecticide application rate play an equally important role as well as the crops cultivated,” explains junior professor Dr. Ralf Schäfer from the University of Koblenz-Landau. “In order to test such complex models, we therefore carried out control measurements of insecticide contamination in freshwater ecosystems from four different regions,” he said. In Southeast Asia, countries such as the Philippines or Vietnam are greatly affected. Helmholtz Center researchers are looking into solutions for such regions together with the International Rice Research Institute, in an attempt to reduce pesticide application rates. One approach could be to revitalize the functioning of ecosystems so that the natural competitors of rice pests can help to avoid their mass reproduction and subsequent harvest yield losses. 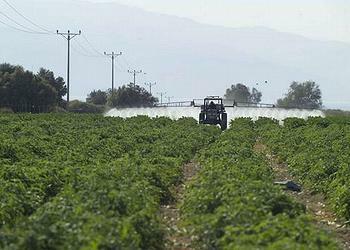 In another approach, buffer zones along the edges of water bodies where chemicals are not applied can reduce the negative impacts of pesticides. The researchers intend to use the global map to sensitize citizens and authorities about this issue in vulnerable regions and to stimulate local investigations.